I'd been feeling like a bit of a loser mom for a while. We had a lot going on in August, and I was getting snappy and short with my kids, and they were spending a lot of their days cranky as a result. One night I was laying in bed, thinking about how cute it is that my Meg is currently obsessed with the concept of camping when she has no practical experience with it, and on a whim I decided to set up a camping trip for her to wake up to. I sneaked downstairs and set up a "campsite" in the middle of the playroom with the kids' play tent, an overturned rug, and a "campfire" of Lincoln Logs and train tracks. The "fishing hole" was made from a blue yoga mat, plastic ducks, a frog beanbag toss game, and some hastily-cut cardstock fish with paperclips clipped to their heads. I made a quick fishing rod with a wooden dowel (pinata stick from Meg's birthday party), twine, and a magnet. 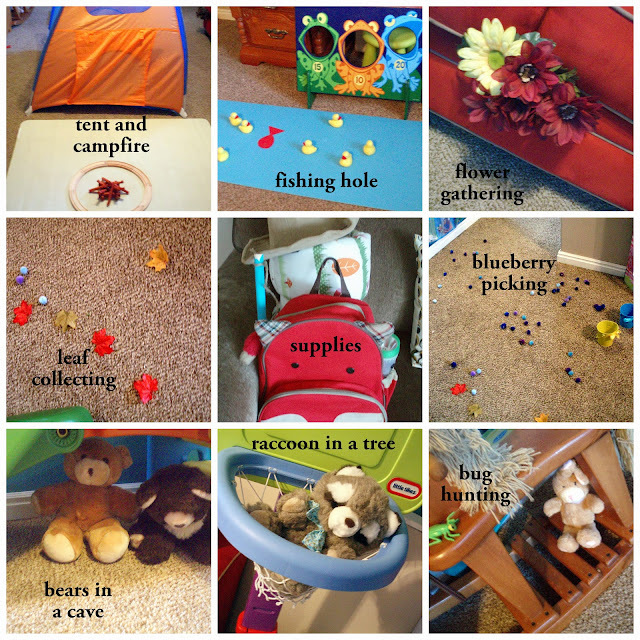 I set up some gathering activities: pom pom "blueberries" (which is a game Meg made up herself ages ago) with tin pails, Dollar Tree faux leaves scattered on the floor, and plastic bugs hidden amongst the playroom toys. I set the scene further by tucking faux flowers into couch cushions and nestling woodland stuffed animals in appropriate "homes." Meg was greeted when she came down the stairs with a backpack filled with bug nets, a magnifying glass, cooking supplies, a flashlight, the fishing pole, a cardboard tube "spy glass" she'd made earlier, a sleeping bag, and an explorer's hat. All told, it took me maybe 15 minutes to set up. She was so excited when she woke up and heard we were going camping! and spent a good long time hiding from bears in the tent. When we finished, we set it all back up and did it again. And again. And again. She's been asking to go camping again every day since, so I'm going to have to set up another surprise trip soon. Things were just tossed together and not very attractively, but the novelty of the activity and one-on-one time with Mom thrilled her. And it didn't cost us a cent!